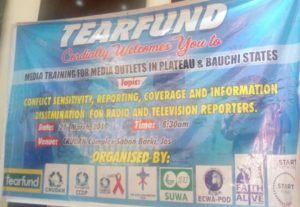 A Non-governmental Organization (NGO) TearFund, has held a one day training workshop for Media Practitioners in Plateau and Bauchi States, focusing on Media and Conflict Sensitivity, Reporting, Coverage and Information Dissemination. The training, which took place at Crudan Office Complex, Sabon Barki Bukuru Express Way, Jos, Plateau State on Thursday 21st March, 2019, had media practitioners from various media houses in Plateau and Bauchi states in attendance, as participants. 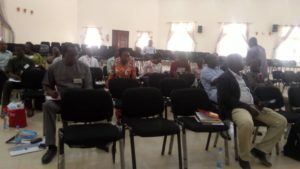 Other collaborating organizations, which took part in organizing and hosting the training include: Crudan, CCDP, CAACP, The ECWA Ministry Team,ECWA Pod, Faith Alive, Start Network and SUWA. Mr. Paul Mershak, the Country Representative of TearFund during the training session disclosed that they have discovered a gap between Media and TearFund, which they hope they would try to fill through organizing more programmes for media practitioners in the States. As an advice, he urged journalists to be objective and be balanced in their reportage in order not to deescalate conflict, “as they are stakeholders in conflict management”. Adding that, “We have about 45 International Non-Governmental Organizations (NGOs) across the country, and the Middle-belt is seen as the center of conflict in the country. This is the more reason, Christian Aid is intervening in Kaduna, Benue, amongst others”. The facilitator of the training workshop, Mr. Wika Gofwen, in his paper presentation, said that for media practitioners to practice professionalism in reporting of conflict issues, ” they must embrace peace Journalism that advocates for balance news coverage, positive education of people about what is going on in a divided society, controlling dangerous rumours and providing a trusted source of information for all parties in a conflict”. 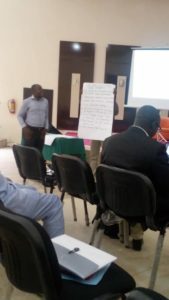 The workshop highlights was the interesting interactive session among the Media Practitioners and Partners to discuss on the expectations and clarifications from both parties. There were Good will messages from the Chairman of Nigerian Union of Journalists (NUJ) Plateau Council, Mr. Paul Jatau, represented by the Secretary of the Council, Mr. Peter Amine. The Chairman of Nigeria Association of Women Journalists (NAWOJ) Plateau State Council, Mrs. Jennifer Yerima, appreciated the organizers and Journalists present for the program. According to Yerima, she looks forward to more opportunities to make Journalists better in their reportage during and after conflict.